A high level meeting was held between Palli Karma-Sahayak Foundation (PKSF) and Food & Agriculture Organization (FAO) Bangladesh (BD) in the PKSF Bhaban on 28 January 2015. The meeting explored the possible cooperation between the two organizations. Mr. Md. Abdul Karim, Managing Director of PKSF led the PKSF team. 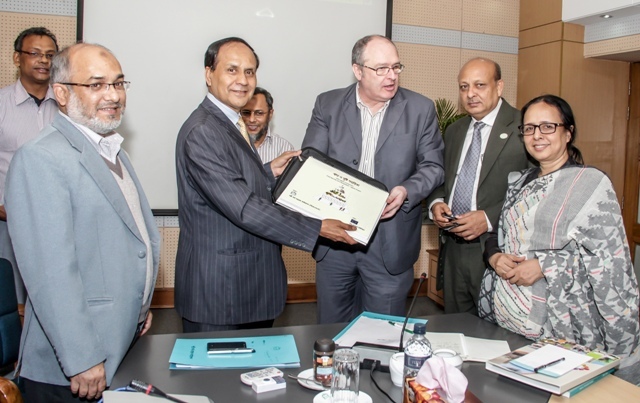 Mr. Mike Robson, Resident Representative of FAO Bangladesh along with Dr. Nur Ahamed Khondaker, Assistant Country Representative (Programme), FAO BD and Begum Nurun Nahar, National Operations Officer & Gender Focal point represented FAO Bangladesh. Besides, Mr. Golam Touhid, Deputy Managing Director (Operations-2); Mr. A.Q.M. Golam Mawla, General Manager (Ops.) & Team Leader (PROSPER); Dr. Sharif Ahmed Chowdhury, DGM (Livestock); Mr. A.K.M Nuruzzaman, AGM (Ops) & Team Leader (Ujjibito); Dr. M. A. Haider, Training Officer (KGF) and Mr. A. M. Farhaduzzaman, Assistant Manager (Ops.) of PKSF were also present in the meeting. One of the main objectives of both PKSF and FAO is to ensure sustainable poverty alleviation and also to ensuring food & nutrition security of the country. For improving farming output under resources constraints conditions, farmers need to have sustained financial services along with advance farming knowledge and technology. Besides, as impact of climate change is already in the horizon, farmer need to adopt climate resilient Good Farming Practices (GFPs). Having, nationwide linkage of PKSF and global experience and technical expertise of FAO, both organizations can play a significant role in shaping sustainable modern farming in Bangladesh. Both parties also showed keen interests to work together in some of the priority areas of agriculture including crop, livestock and fisheries sectors. FAO BD can extend supports for capacity building of PKSF and PO’s staffs as well as farmers on new agricultural technology. They can also help farmers in adopting Sanitary and Phyto-sanitary (SPS) measures and other World Trade Organization (WTO) compliances for exporting farm products to international market. For strengthening possible mutual cooperation both organizations agreed to sign a Memorandum of Understanding (MoU).